So we’ve brought you a couple of almost introductory type posts about new Balance and their recent ventures back into football, and it seems only right that we keep on top of football news… well, we’ll try! Anyway, if we had to choose between the Visaro and the Furon, then we’d choose Visaro, and our decision was made relatively easy when we got to check out these New Balance Visaro K-Leather “Black”. 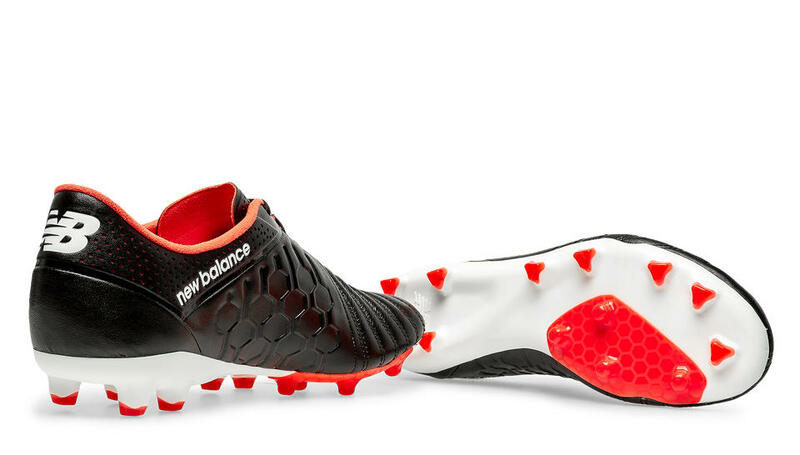 The New Balance Visaro K-Leather “Black” is constructed with an extremely soft K-leather (kangaroo leather) upper using a honeycomb style stitch pattern on the Low Pressure Zone located on the instep, which provides the player with increased ball feel. The black kangaroo leather upper is complimented with white details such as the ‘NB’ logo on the heel, ‘new balance’ text on the medial side, the ‘N’ logo on the lateral side, and the sole plate. As good as black and white is, the addition of red to the sole plate, lining and tongue adds the perfect amount of colour, making this boot pop. For those who like their boots to be subtle, and have a classic style, then these are definitely for you! The New Balance Visaro K-Leather “Black” comes in both FG (firm ground), and SG (soft ground), with the FG version pictured above in this post, and the SG version below. They are priced at £140 and £145 respectively, and the FG version comes in two different widths – standard or wide. If you want to check out a more descriptive post on the Visaro, then click here. Click to shop the full New Balance Football range.